The China’s Communist Party's top official in the Tibetan region, Chen Quanguo, announced on Wednesday [8 April 2015] new measures to be put in place to assess the patriotism of Buddhist monks and nuns, adding to tensions in the region. He promised to introduce assessment activities to ensure patriotic and law-abiding nuns and monks, living in harmonious monasteries. He also added that the Communist Party's presence in religious buildings is important. The press officer for the Central Tibetan Administration, Tsering Wangchuk, considers these statements provocative, fearing that such a policy will only make the situation in Tibet more difficult and unstable. China's top Tibetan official has continued to test the resolve of the region's citizens by announcing that Buddhist monks and nuns would begin to be evaluated for their "patriotism," while stating that national flags will be placed in all monasteries. The Communist Party's regional chief Chen Quanguo has been adding to tension in the disputed region, through what critics told VICE News are unessential and inflammatory restatements of the China's ongoing battle for ideological control over Tibet. On Wednesday Chen vowed to introduce unspecified "assessment activities" to ensure that "patriotic, law-abiding monks, and nuns" would operate in "model harmonious monasteries." Last week, he wrote in Qiushi magazine that the relationship between the region's nearly 50,000 monks and the Chinese leadership needs to be as it would be between "friends." Chen added that the Communist Party's presence and visibility in religious buildings was important. "Let the monks and nuns in the temples and monasteries have a personal feeling of the party and government's care and warmth; let them feel the party's benevolence, listen to the party's words and follow the party's path," Chen said. 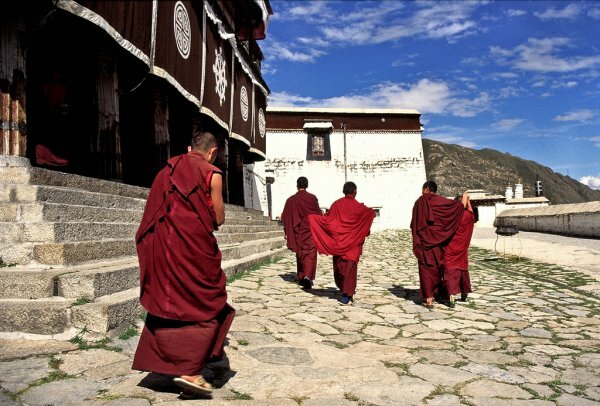 "Monks and nuns should not have to go out of their temples or monasteries to understand the party and government's policies and social progress, or Tibet's peace, stability, and good fortune, so as to be guided to follow a path of revering scientific culture." Tsering Wangchuk, press officer for the Central Tibetan Administration, spoke to VICE News about the comments, which he labeled "provocative." "Time and again [Chen] has given such senseless comments, completely devoid of any understanding of the culture and the values of the Tibetan people living in that area," Wangchuk said. "This kind of comment and this kind of policy action would only make the situation worse in Tibet. As of now Tibetans have been law-abiding and Tibet has been peaceful." Wangchuk said that the lack of violence in the region had been "largely because of the Tibetan Buddhist culture that has encouraged Tibetans to be more mindful of their actions towards any difficulties. When the Communist Party wants to attack [that] institution I think this would only destroy the situation and would push the situation into [one that's] more difficult and unstable." Wangchuk also said that the kind of comments that were being made by Communist Party officials could become the instigators of a "kind of violence" in the Tibetan region. "Certainly if there is any prospect of violence I would squarely put the blame on such policies or action," he added. Matteo Mecacci, a former member of the Italian parliament and current president of the International Campaign for Tibet, told VICE News that he believed the only thing that was new about Chen's recent statements is that they are becoming "more and more aggressive." "Communist Party officials have for a long time tried to control all activities that are taking place, in Tibet in particular in monasteries," he said. Mecacci also pointed out that there is already a state presence in most monasteries. "Basically in every monastery in Tibet there is a police station which has a duty to make sure that what is taught in the monasteries and said in the ceremonies are in line with the party policy," he said, adding that this is a "blatant denial of religious freedom." Mecacci told VICE News that he believes the Chinese state "wants to take control of every aspect of society, even the thinking of the people," but also that the constant reassertions of that fact only serve as a sign that "basically they have acknowledged that they're failing." "If they were certain in their policies they wouldn't need to restate them every year, so it's a sign of uncertainty," he said. "They know that they don't have the allegiance of the Tibetan people and this is the reason why they're pushing. The problem is that the more they push with these aggressive policies the more reaction to it they will get." China's relationship with the Dalai Lama has recently become more complex, after the 79-year-old announced that he might not reincarnate as a political leader. Tenzin Gyatso — the 14th Dalai Lama — has been in exile since 1959 and the failed Tibetan uprising against the Chinese government. He is currently on a trip to Japan, where he has addressed an environmental forum, and also met with groups of students and doctors. While his schedule is busy, the countries he visits can also become embroiled in political disputes with Beijing. Last week China praised Sri Lanka for avoiding a visit from the religious figure. One of the main concerns in the future, Mecacci said, is what will happen when the Dalai Lama passes on.